Saturday Bike Club 9th March 2019 is cancelled today due to the bad weather. Former British Cycling Club of the Year and Highly Commended on the Bradford Sports Awards of 2018. East Bradford Cycling Club is over 100 years old but is certainly not stuck in the dark ages. Set up initially with time trials as it’s main interest, it has now developed through the kids section into a vibrant and up to date club, with particular emphasis on developing young cyclists from riding without stabilisers to competing in national competitions. mer, two club championship events (1 is a handicap event) in April and September and a Hill Climb in October each year. As a member of EBCC you can ride open time trial events run by other clubs (see the CTT website for details). Members also arrange rides between themselves. Our members also race in various disciplines including cyclo cross and mountain bike. coaches. Now joined by several British Cycling coaches, the club offers a variety of training sessions for all disciplines form road, to MTB to track to cyclocross, turbo, rollers and beyond. Our riders range from those who want to have fun on a bike to those who want to race, some of our youth riders have represented the club nationally and even internationally as well as representing Yorkshire at Inter Regional Events. The main sessions are at the Richard Dunn Sports Centre in Bradford, partly on our all weather pitches for skills and also on our custom built traffic free 1 km road circuit. Ages of our youth section range from approx three to sixteen. Running most Saturday mornings all year round from 10:30am to 12:30 if good weather and under the overhang in bad weather, we can offer something for all. In addition there are training sessions on an evening for road, mtb and cyclo cross throughout the year. The Club also organises weekly Sunday club runs alternating with a family ride and a faster ride for older adults and youths. These are mainly road but we also run occasional mtb rides. In Winter we offer weekly roller/turbo training in winter. There are occasional family rides for the very young ones on traffic free routes and twice yearly youth hostel trips. The road training has seen a huge increase in interest and we regularly train 25 plus kids in all road skills from Bikeability to race skills with similar numbers on the pitches. Often with guests from other clubs who are welcome to join in. Details of what we offer are in the relevant pages on our site – see the header above. Come and visit us, you will be made very welcome. Bullying is one form of personal harassment. It is the abuse of power or position to persistently criticise or humiliate and undermine an individual’s confidence. Bullying is covered in British Cycling’s Equality Policy BC Handbook 2016 and disciplinary action may be taken against any member or volunteer who contravenes the Equality Policy. RIGHTS– Coaches must respect and champion the rights of every individual who participates in sport. RELATIONSHIPS – Coaches must maintain a professional attitude with athletes and others based on openness, honesty, mutual trust and respect. RESPONSIBILITIES:PERSONAL STANDARDS -Coaches must demonstrate proper personal behaviour and conduct at all times. STANDARDS – To maximise the benefits and minimise the risk to athletes, coaches must attain a high level of competence by attaining qualifications and through commitment to ongoing training that ensures safe and correct practice.  Discourage unfair play and arguing with officials.  Help your child to recognise good performance, not just results.  Never force your child to take part in sport.  Set a good example by recognising fair play and applauding good performances of all.  Never punish or belittle a child for losing or making mistakes.  Publicly accept officials’ judgements.  Use correct and proper language at all times.  Encourage and guide performers to accept responsibility for their own performance and behaviour. 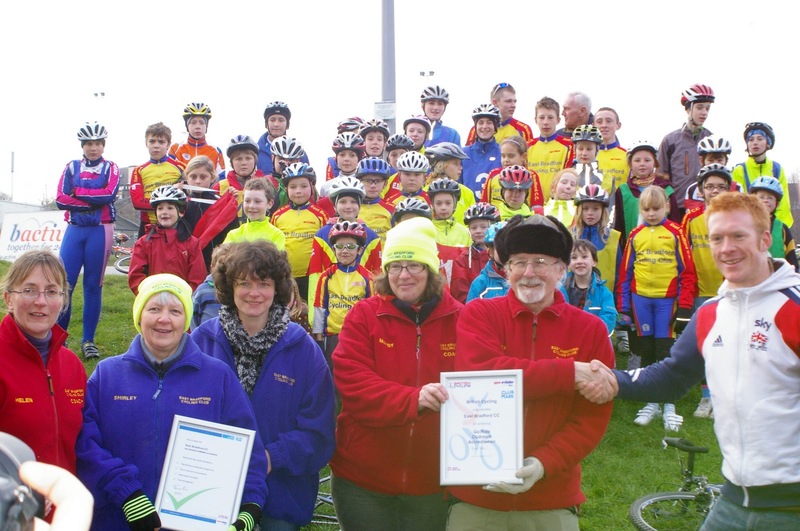 East Bradford Cycling Club is a Clubmark British Cycling Go Ride Club. We provide a programme of activities and Go Ride coaching sessions aimed at young riders up to the age of 18 years. We also have a thriving adult membership.East Bradford Cycling Club is over 100 years old but is certainly not stuck in the dark ages. Set up initially with time trials as its main interest, it has now developed through the kids section into a vibrant and up to date club, with particular emphasis on developing young cyclists from riding without stabilisers to competing in national and international competitions. With several British Cycling qualified coaches, there are training sessions and rides for all ages. The weather can be quite cold at Richard Dunn, especially in Winter so please ensure you have suitable clothing for the weather conditions. Gloves and warm clothing are essential in colder weather.Running most Saturday mornings all year round from 10:30 am to approx 12.30 , we can offer something for all. There are two main options on a Saturday, the Skills Group and the Roadie Group. Anyone can join in the Skills group straight away but in order to take part in the Roadies Group, children must be at least 8 years old and have passed their Bronze + Skills Test. Once passed, children can move freely from skills to roadies and vice versa. Roadies is not a progressions from skills, just a choice for children to take part in depending on what they enjoy. Children who are under 8 or have not passed their Bronze + still get a weekly session on the track after break and a monthly Time Trial around the full circuit. Weekly Road racing skills for children who have passed the club’s Bronze Plus Skills test. 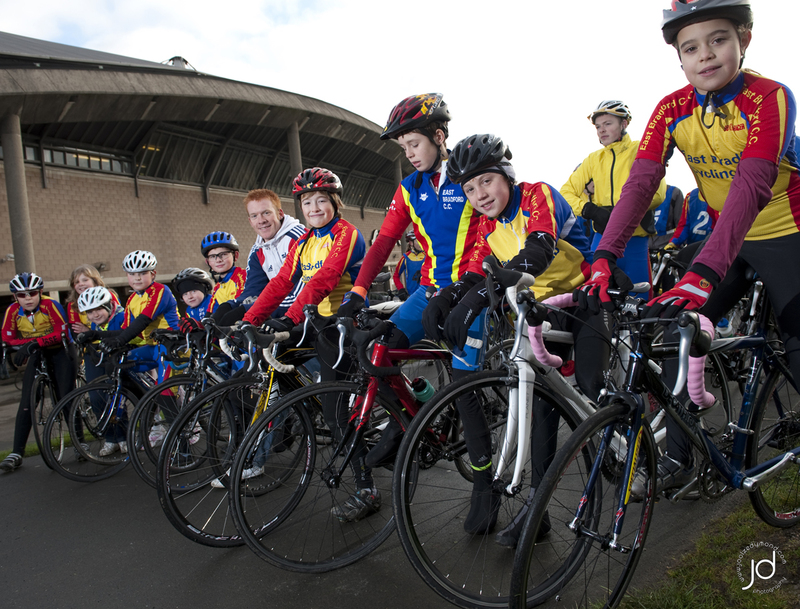 Run each week on the cycle circuit, these include group riding, sprinting, cornering and bike handling skills. In addition there are weekly cyclo-cross/mtb training sessions on an evening with various club runs through the year in MTB, Cyclo-Cross and Road. In Winter there are weekly road sessions via Mandys Mondays for 11 to 18 year olds as well as indoor roller/turbo training for all. There are fortnightly social rides to include children (Minimum Age for accompanied children is 10), twice yearly youth hostel trips. and for the very young ones occasional rides on traffic free routes. Thursday Night WWW.Women’s Wheelers and Wobblers Sessions in Summer. Each summer from May until August the female coaches are delivering weekly coaching sessions on a Thursday evening at Richard Dunn Sports Centre, 6.30 till 8pm, (womens wobblers and wheelers) See Women’s SectionAll ladies, over 12, so young and old, confident or not are welcome to come along for skills, fitness and a social! We also have a very active competition section with many of our members from children to adults racing road, mountain bike, track and cyclo-cross.We have had an impressive number of podium results across nearly every discipline Check our Disciplines and Events Page for more information. Joe Parker showing how to get air! RELATIONSHIPS – Coaches must develop a relationship with athletes and others based on openness, honesty, mutual trust and respect.